The activation of the 485th Bomb Group took place at the Fairmont, Nebraska Army Air Field in September 1943, from the original cadre which was actually assembled from the 29th Bomb Group, stationed at Gowen Field, Boise, Idaho. The group consisted of four squadrons (828th, 829th, 830th and 831st). After the group was formed, it began receiving ground personnel and air crews from various sources, including advanced training fields across the country. The original group commander was Colonel Walter Arnold and his squadron commanders were Captain Edward Nett (828th Squadron), Captain Maurice Boney (829th Squadron), Captain Richard Griffin (830th Squadron) and Captain Daniel Sjodin (831st Squadron). Shortly after the group was formed, the air echelon was sent to Orlando, Florida for 30 days advanced training, in order to better prepare them for combat. Colonel Walter E. “Pop” Arnold Jr, first 485th commander. The crews received additional training at Fairmont and by early March 1944 their training was completed and they were deemed fit for combat. The 72 crews from the four squadrons began their individual overseas flights, initially flying to Brazil, with stops along the way, and then continuing the long overseas flight to Dakar, West Africa. From there they flew on to Marrakech and then to Oudna, Tunisia. Sadly, one of the planes (piloted by Robert Olney) stuck a mountain, resulting in the loss of the entire crew. The group began flying practice missions in Tunisia and by April 15, 1944 the crews began flying their planes to a field near Venosa, Italy, where a landing field had been constructed from PSP (pierced steel planking). While the air echelon from the 485th was preparing to fly overseas, the ground echelon left Fairmont, Nebraska on March 11, 1944, enroute to Hampton Roads, Virginia. For the flight overseas most of the air crews replaced one crew member with other important personnel, such as a crew chief, staff officer, flight surgeon or other key person. While about 56 of the Headquarters detachment left Hampton Roads in late March, most of the men boarded troop ships on April 2nd and began their overseas voyage. On the night of April 20, 1944 the convoy was attacked by JU-88 torpedo bombers in the Mediterranean Sea, off the coast of Algiers. Three ships were sunk, including the liberty ship SS Paul Hamilton. This ship carried 154 officers and men from the 485th Bomb Group, most of them from the 831st Squadron. The Hamilton exploded and sank within 30 seconds and all personnel aboard were lost. It would later become recognized as one of the greatest Liberty Ship disasters of WWII. The other 485th ground personnel, on various other ships in the convoy, made it safely to Italy and made their way to their new home at Venosa. The 485th Bomb Group was one of four heavy bomb groups assigned to the 55th Bomb Wings, the others being the 460th, 464th, and 465th Bomb Groups. The 485th began its combat operations on May 10, 1944 with a mission to bomb the marshalling yard at Knin, Yugoslavia. Their final mission was flown to the Linz, Austria marshalling yard on April 25, 1945. The group received a Distinguished Unit Citation for the June 26, 1944 mission to the Florisdorf Oil Refinery in Vienna, Austria, led by Dan Sjodin, 831st Squadron commander. 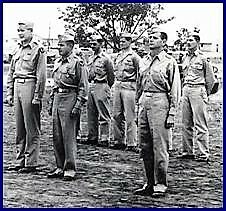 Colonel Walter Arnold, second from left, front row, receiving a medal. The 485th Bomb Group was the last group to join the 55th Bomb Wing in Italy and was the first group to return home. After the final mission was flown, plans were underway immediately to disband the base. Airmen with 11 missions or fewer were being transferred back to the U.S. to prepare for assignment to the Pacific theater. Airmen with 32 sorties or more were being credit for a competed tour (35 sorties) and were being transferred to the U.S. Airmen with 11-31 sorties were transferred to the 460th, 464th, and 465th Bomb Groups, for the possibility of completing their combat tours. (No additional combat missions were flown by these groups and the airmen transferred to these groups eventually returned to the U.S.) The ground echelon was transferred to the U.S. The 485th Bomb Group was stationed at the Sioux Falls, South Dakota Army Air Force base on its return and was transferred to Sioux City, Iowa a few months later. By this time few, if any, of the men who served in Italy were still assigned to the 485th. Colonel Walter "Pop" Arnold was the group’s first commander. 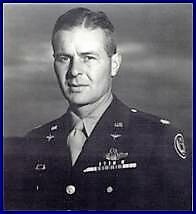 Colonel Arnold helped train the group for combat and led many of the early raids. He was shot down by flak over Blechhammer, Germany on August 27, 1944 on his 19th combat mission. He survived the war and stayed in the Air Force, retiring as a major general. Colonel John Tomhave, second from left, with staff. Left to right: Major Roy Reeve, Group Operations Officer, Tomhave, Lt. Colonel William Herblin, Deputy Group Commander, and Major Walter Ladner, Group Intelligence Officer. Colonel John Tomhave became the group’s second commander, replacing Colonel Arnold when he was shot down. Colonel Tomhave was shot down by flak on February 16, 1945, near Villach, Austria, while returning from a mission to Regensberg, Germany. He managed to bail out and was captured by the Germans, but was killed on February 22, 1945 when Allied fighters strafed a POW train he was on. Colonel John Tomhave in Yankee Doodle Dandy. The third commander of the group was Colonel John Cornett, who replaced Colonel Tomhave. Colonel Cornett was shot down on March 22, 1945 while leading a mission to Vienna, Austria. Colonel Cornett survived the war as a POW. 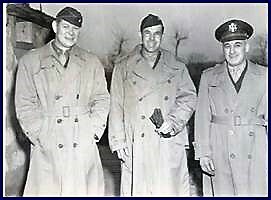 Left to Right: Brigadier General George Acheson, 55th Wing Commander, Colonel John Cornett, and General Nathan Twining, Commander Fifteenth Air Force. The fourth and final commander of the 485th Bomb Group in Italy was Colonel Douglas Cairns, appointed to this position on March 23, 1945. He remained in command until the group returned to the U.S.
All four group commanders of the 485th Bomb Group were combat commanders, as can be evidenced by their loss rate of 75%. Although they had a choice, they often chose the rough missions. The same can be said of the deputy group commanders, squadron commanders, and other flying staff personnel, although their loss rates weren’t as high. According to official records, the 485th Bomb Group flew a total of 187 combat missions, dropped 10,550 tons of bombs on enemy installations and was credited with destroying 61 enemy aircraft, probably destroying 41 more and damaging 37 others. Fifteen additional enemy aircraft were destroyed on the ground. 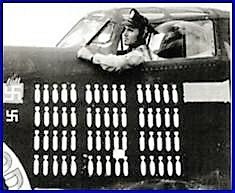 The 485th officially lost 59 bombers in aerial combat and 62 others in accidents or salvaged as a result of combat. Approximately 3500 men served in the 485th bomb group in Italy. This number includes air crew (2500+) and ground staff. The 485th lost at least 475 men who were killed in combat or who died from combat-related injuries. Approximately 250 airmen became POWs. Thirteen airmen were captured, but managed to escape and return safely to Italy. At least 140 men from the group were shot down, but managed to evade capture and return safely. 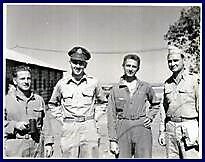 The men of the 485th Bomb Group are proud of their efforts and contributions in WWII. Their accomplishments on June 26, 1944 are memorialized at the U.S. Air Force Academy at Colorado Springs, Colorado. The 485th Bomb Group (H), Fifteenth Air Force, in a formation of 36 B-24 aircraft flew a mission to Vienna, Austria on 26 June 1944 to attack the Florisdorf Oil Refinery. The Group inflicted grave and massive damage to the refinery, despite heavy flak and intense fighter opposition, and crippled the enemy’s vital fuel production during a crucial period of WWII. The 485th Bomb Group was awarded a Unit Citation for this successfully completed mission.